The AUD/USD gained 31 points in the Asian session after the RBA statement to trade at 0.7829. The currency headed for its biggest weekly gain in a month as the Reserve Bank of Australia in its quarterly statement projected underlying consumer-price growth at an annual pace of 2.25 percent by June, still within its band of 2 to 3. New Zealand’s dollar also rose. The euro was poised for its biggest weekly advance in 16 months as a European Central Bank official said Greek banks will have access to emergency funding. Australia’s dollar rose for a second day as the central bank kept its outlook for annual inflation within its projected band even as it lowered its forecast for prices and growth. The RBA reduced its forecast average expansion for this year to between 1.75 percent and 2.75 percent from between 2 percent and 3 percent estimated in November. Governor Glenn Stevens and his board lowered the official cash rate target to a record-low 2.25 percent on Feb. 3 after monetary authorities including the Bank of Canada and ECB added to stimulus in January amid global disinflation risks. The Aussie has tumbled 4.3 percent in the past three months, the third-worst performer of 10 developed-nation currencies according to Bloomberg Correlation-Weighted Indexes. The euro weakened 2.9 percent, while the U.S. dollar gained 5.7 percent. Glenn Stevens’ speech, Australian employment data, Mark Carney’s speech, BOE Inflation Report, US retail sales, Unemployment Claims and Prelim UoM Consumer Sentiment are the major market movers for this week. Here is an outlook on the highlights coming our way. Last week Non-Farm Payrolls release exceeded forecasts with a 257,000 jobs gain in January, following 329,000 addition in the previous month. Economists expected a gain of 236,000 positions. However, the unemployment rate edged higher to 5.7% from 5.6% in December. Full-time positions edged up 777,000, reaching more than 120 million for the first time since July 2008. The strong job gain together with a smaller than expected rise in the number of jobless claims indicate solid economic recovery. Will this trend continue? Glenn Stevens speaks: Monday, 0:15. RBA Governor Glenn Stevens is scheduled to speak in Sydney. Australia’s central bank cut its cash rate to a minimum low of 2.25% after 18 months of static rates. Stevens may elaborate on the reasons behind the unexpected rate cut and talk about deflationary pressures and the impact of foreign markets on RBA’s recent policy decision. Australian employment data: Thursday, 0:30. Australia’s job market expanded in December, adding 37,400 jobs, well above the 5,300 increase forecasted by analysts. The big job gain lowered the unemployment rate from 6.2% to 6.1%. The increase in positions showed a solid rise in full-time jobs compared to a slight fall in part-time jobs. Furthermore, the participation rate increased to 64.8% in December from 64.7% in the prior month, indicating the economy is expanding. Australia’s labor market is expected to contract by 4,700 jobs, while the unemployment rate is predicted to climb to 6.2%. Mark Carney speaks: Thursday, 10:30. The Bank of England governor, Mark Carney is expected to speak in London about the Inflation report. Carney has launched a strong attack on austerity measures in the Eurozone, claiming such measures are too harsh to enable recovery and may lead the 18-nation single currency area deeper into a debt. He noted that low inflation in the euro-area is potentially dangerous to growth and calls for a real course of action to escape the debt trap. UK inflation data: Thursday, 10:30. The Bank of England noted in its November inflation report that the economy is expanding more slowly and price pressures declined from the previous three months. The slower growth was caused by sluggish expansion in global economies and weaker growth forecast. The Central bank noted the slowdown in the housing market and the low commodity prices weighing on CPI inflation. US retail sales: Thursday, 13:30. U.S. retail sales plunged 0.9% in December, posting their largest decline in 11 months after positive growth in the fourth quarter. The sharp fall may be attributed to seasonal adjustments after the holiday spending spree. Economists forecasted a 0.2% gain. However lower gasoline prices are expected to boost consumer spending in the coming months. Meanwhile, Core sales excluding automobiles dropped 1.0% following a 0.5% gain in the previous month and lower than the 0.1% increase predicted by analysts. Retail sales are expected to decline 0.3%, while core sales are predicted to drop 0.4%. US Unemployment Claims: Thursday, 13:30. The number of jobless claims rose less than expected last week, reaching 278,000 following 267,000 in the previous week. Analysts expected a larger gain of 287,000. Claims were volatile in recent months due to seasonal changes, but remained positive. The four-week moving average fell 6,500 to 292,750 last week. jobless claims is expected to reach 279,000 this week. US Prelim UoM Consumer Sentiment: Friday, 15:00. Consumer sentiment spiked in January to 98.2, exceeding economists’ forecast of 94.2, rising 4.4 points higher than in December. Lower gasoline prices as well as the ongoing improvement in the labor market boosted spending and raising consumer sentiment to an 11-year high. The economy is in solid growth at the beginning of 2015 and is expected to continue this positive trend. Consumer sentiment is expected to remain at 98.2 this time. Dollar Survives Reversal, Can Rate Speculation Hold Back Gravity? Yields and counterparty risk have revived the Dollar, but is it enough to keep pace on its incredible rally? The Dollar came dangerously close to starting a speculative landslide this past week. Yet, once again fundamentals have stepped in keep the record-breaking seven-month bull trend intact. While the bull trend stands heading into the second week of February, there is relatively little conviction to launch forward with Monday. This past week’s NFPs have revived Fed rate expectations and deteriorating conditions in the Eurozone leverage a liquidity appeal for the Greenback. However, the policy contrast has likely reached its near-term limit and an anti-Euro haven may not provide the necessary degree of motivation to keep this pace. Had it not been for the favorable outcome from the January employment figures this past week, the US Dollar may have very well dove into a correction. The headline data looked mixed – the net payrolls beat expectations by a modest 29,000 jobs while the unemployment rate unexpectedly ticked higher to 5.7 percent. Neither of these developments significantly alters the trend of improvement lauded by the Fed officials. The real surprise was in the underlying figures that the FOMC considered more ‘qualitative’. The participantion rate picked up from a near four-decade low, but it was the the 0.5 percent jump in wages (the biggest in seven years) and 2.2 percent pace that jump started the flagging rate speculation. What the wage data represents is the potential genesis for inflation – the missing ingredient for hawkish conviction at the Fed. After the data was processed by the market, 2-year Treasury yields surged 24 percent (to 0.6435 percent) – the biggest move since December 7, 2010. Following suit, Fed Funds futures pricing the rate forecast through December added another 11 bps of expected tightening and the probability of a July hike rose to 52 percent. As we move closer the mid-year policy meetings (June 17 and July 29), speculation will intensify as data paths become clearer and time runs short. However, we are still four months out, and this week’s docket is light for data that is capable policy fodder. So while, the Dollar can maintain its advantage well enough; it will struggle to press it. The burden facing the Dollar is largely a speculative one. Looking to speculative futures positioning in the COT report, we find this segment of the market is already long in record numbers (over half a million contracts). One-sided bets are prone to corrections from profit taking to de-levering. What’s more, the same strength that the currency has enjoyed for its favorable yield forecast can also turn it into a risk prone currency in the event of a broader risk aversion effort. Short-term FX positions looking to ride the yield disparity would be as motivated to unwind as those that were long traditional carry or equities. And, while the Dollar would eventually regain its footing should selling turn to pure liquidation; there is a large gap between speculative shakeout and liquidity scrambling. Perhaps the Dollar’s most promising fundamental backer heading into the new trading week is a worsening of global confiditions that can hasten the demand for liquidity. This is especially true of the Euro where Greece’s debt standoff has found the country with one less important liquidity line and an accelerated time line issued by an unaccommodating European community. Another possible source of strength for the reserve currency is further fallout from global stimulus. We’ve already seen Switzerland’s central bank falter under the ECB’s efforts, and many others were already struggling before that. Cracks in the façade of complacency can quickly expose more systemic issues – such as asset bubbles. The Japanese Yen finished the week noticeably lower versus all major counterpart and pushed the US Dollar/JPY exchange rate through key resistance. Could this be the start of a larger USDJPY breakout? The interest rate-sensitive JPY was among the biggest losers as the US Dollar surged on a strong US Nonfarm Payrolls report. Yet a noteworthy drop in FX volatility prices suggests that relatively few expect similarly large moves ahead. Indeed, limited economic event risk ahead may keep US Dollar pairs in tight trading ranges—limiting our enthusiasm on fresh USDJPY-long positions. Any substantial surprises out of upcoming Japan Trade Balance results, Industrial survey data, or Producer Price Index inflation numbers could force a Yen reaction. Yet traders have proven relatively indifferent to Japanese economic data, and sharp post-event moves seem relatively unlikely. A strong correlation between the USDJPY and US Treasury Yields will thus keep us mostly focused on US economic data. To that end we’ll watch the upcoming US Advance Retail Sales report for potentially meaningful reactions from yields and the USDJPY. It thus far looks as though it will be a quiet week for the Japanese Yen. And despite its substantial post-NFPs rally, the USDJPY remains in a broad consolidative range dating back to December highs. Only a break of significant resistance near January’s peak of ¥121 and eventually 8-year highs near ¥122 would change that. We subsequently remain somewhat bearish the USDJPY (bullish the Japanese Yen) through the foreseeable future. The Bank of England interest rate decision produced no changes in policy last week, leaving the British Pound without guidance on where Governor Mark Carney and company intend to steer going forward. The markets will look to dispel this uncertainty in the week ahead as the central bank publishes its quarterly Inflation Report. Officials have used the document and its accompanying press conference as the primary vehicle for announcing policy and outlook changes over recent years. As we discussed in our first-quarter forecast, sinking Eurozone economic growth expectations have weighed heavily on BOE interest rate hike expectations since mid-2014. This is not surprising. The Eurozone is the UK’s largest trading partner: the share of total exports headed for markets on the Continent has been on the rise and is now hovering near a two-year high of 48 percent. That means that even as the UK economy has recovered from the 2008-09 recession, its sensitivity to headwinds from the Eurozone has increased. With this in mind, it is no wonder that Mr Carney has recently remarked that policy normalization may come slower than previously expected. That much is likely to be reflected in the BOE’s updated forecasts for growth and inflation, both of which will probably edge lower. The larger question is whether this is likely to weigh on the British Pound. The currency has been trending firmly lower alongside fading tightening bets for months, so much of the negativity to be expressed in the Inflation Report may be priced in already. Indeed, backing out priced-in expectations from Sterling interest-rate futures reveals traders don’t envision a hike sooner than the fourth quarter. OIS-based indications are even more pessimistic, pointing to no tightening until at least the beginning of 2016. On balance, this suggests the British Pound may be disproportionately more sensitive to a hawkish surprise in the central bank’s rhetoric than a dovish one. The currency may not suffer too badly if the markets’ unwinding of rate hike bets is validated. If policymakers firmly remind investors that the BOE does not intend to join the increasingly wide-spread lurch toward stimulus expansion and maintain the next policy change will be to reduce accommodation, the UK unit may rise. 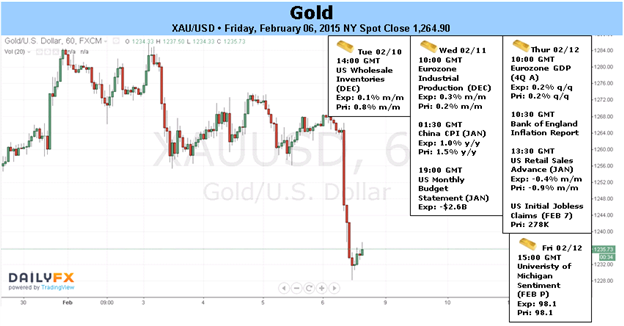 Price & Time: Gold Advance Resuming? Gold prices plummeted this week with the precious metal off more than 4% to trade at $1231 ahead of the New York close on Friday. The losses come on the back of a stellar US employment report with shifts in interest rate expectations propping up the greenback at the expense of the yellow metal. Gold now looks to test a key support structure with the technicals suggesting that shorts are at risk near-term. The November Non-farm Payroll report released on Friday showed the US economy adding 257K jobs last month, far surpassing the expectation for a print 228K. The move was accompanied by a massive upward revision to the previous month’s data from 252K to 329K with average hourly earnings topping expectations across the board. Although the unemployment rate did unexpectedly rise to 5.7%, the move comes alongside a 0.2% increase in the labor force participation rate, which was off its lowest levels since the late 1970s. The U.S. Dollar surged across the board with the Dow Jones FXCM Dollar Index paring nearly the entire weekly decline. Still, the index remains in a precarious position, holding just below the 2009 high. Gold plummeted 2.5% on Friday as expectations for a Fed interest rate hike later this year were re-affirmed. Looking ahead to next week, traders will be looking for more updates on the US consumer with advanced retail sales and the preliminary University of Michigan Confidence Surveys. Should the data continue to top estimates, look for gold to remain on the defensive as the luster of the yellow metal wanes amid rising interest rate expectations. That said, near-term gold looks to be coming into key technical support heading into next week. From a technical standpoint gold broke below the 200-day moving average on Friday for the first time since January 15th with the decline taking prices into the lower median line parallel of a pitchfork formation dating back to the November low. This trendline also converges on a median line off the July 2013 highs and could offer some near-term support. We’ll reserve this threshold as our medium-term bullish invalidation level with a break below targeting support objectives at $1206 & $1197. That’s said, shorts are at risk here with interim resistance seen at $1248/52 and $1268. We’ll be looking for a low early next week with our basic near-term focus higher while within the confines of the November median-line structure. The Nikkei as you can see initially fell during the course of the week but turned back around below the ¥17,500 level to form a hammer. The hammer of course is very bullish sign, and as a result we believe ultimately this market will form enough bullish pressure to break above the ¥18,000 level. With that, we are bullish and have no interest whatsoever in selling. We believe that the level below should continue to offer buyers, and that this market will ultimately break out and head to the ¥20,000 level. The DAX as you can see broke higher during the course of the week, testing the €11,000 level. Ultimately pulling back though, and forming a shooting star of sorts. This is the second week in a row that we formed a shooting star, so a pullback from here makes a lot of sense. What frankly, we think that there is a lot of support below and it’s very likely that we will see the market test for support and find a supportive candle in order to start buying. On the other hand, if we break the top of the shooting star and clear the €11,000 level, this market should then go much higher. The NASDAQ broke higher during the course of the week, testing the 4800 level as you can see. With that, the market should continue to go higher we can break that level, as we should then head to the 5000 handle. With that being the case, the market looks as if it is ready to test that area and perhaps even go higher than that. We are most certainly in an uptrend, and as a result we are “buy only” at this point in time. We believe that the 4600 level below is in fact supportive. The S&P 500 as you can see broke higher during the course of the week, but struggled to get above the 2060 handle. Because of this, looks like we’re ready to continue consolidating, but we believe that ultimately the market will break higher. In the meantime, expect a lot of sideways action as far as long-term trades are concerned and as a result we have no interest whatsoever in placing a longer-term trade into we break out to a fresh new high. Any trading in this market probably going to be off of shorter-term charts.